The CD version is a special composition of the music for the performance piece „Wenn uns jemand sieht - sag -wir haben einfach kurz Luft geschnappt“ by Anja Winterhalter premiered in 2010. Skipping Spaces“ 2011 by Anja Winterhalter. All music by Gregory Büttner. Cover-pictures by Alexandra Griess. Thanks to Anja Winterhalter. Gregory Büttner lives and works as a musician and artist in Hamburg. Since 2000 his main focus is on sound art and electroacoustic compositions. He performed at several festivals and concert series in Europe and China, composed music for dance and performance, radio, video and sound installations. In 2004 he launched his label 1000füssler which releases experimental music in small editions. He plays regularly in a duo with Birgit Ulher and ‘Stark Bewölkt Quartett‘ with Michael Maierhof, Heiner Metzger, Birgit Ulher. He also collaborated with musicians Rhodri Davies, Ofer Bymel, Stefan Funck, the artist Anja Winterhalter, Stefanie Becker, Magdalena Sadziak, among others. His music released by labels like 1000füssler, Firework Edition Records, Anthropometrics / Aufabwegen, Herbal, Creative Sources, Hideous Replica, Materialverlag der HfbK, Obs*, Grünrekorder, Compost and Height. Video "Wenn uns jemand hört - sag - wir haben einfach kurz Luft geschnappt" by Alexandra Griess. This video is a independent visualisation of the music and not part of the original performance piece. If Someone Hears Us… Another item from Gregory Büttner, the Hamburg sound artist who is very good with small sounds and generally doing more with less. We’ve heard him doing it with electric fans, loudspeakers, and even cacti prickles. On Wenn Uns Jemand Hört  sag  wir haben einfach kurz Luft geschappt, he’s doing what he does best with minimal drones, a highly-controlled species of glitch, and most probably sine tones generated by his numerous devices. The title track is very strong with its clashing timbres; cutting off one abstract sound and replacing it with another, or even with silence, so that we may better appreciate the grain of the digital tones. This particular 18-minute piece has a connection to a performance piece of the same name by Anja Winterhalter. For that piece, Büttner remains silent on the means of production, but is more forthcoming when describing the method used to make ‘Falte’, a 33-minute work which was also related to Anja Winterhalter’s installation/audio work. ‘Falte’ is composed from “sine waves, digital crackle and white noise”; when played back over loudspeakers, these sounds created additional interesting events as they interacted with the physical objects which Büttner had put in place as natural resonators  tin cans, tubes, and boxes. One more pass of treating that re-recording output was needed in order to compose the final piece we hear. This tells us something about the distillation involved in Büttner’s works. Result is a high-scoring piece of dynamic micro-noise. It’s incredibly detailed, and quite episodic in nature; a wide range of distinctive, though subtle, tones will reward the listener, including drones, burbles, buzzes, loud eclats, and strange humming. Even though Büttner’s work is thoroughly process-based and extremely abstract in nature, I always find it a compelling listen. It feels as though he’s making visible some elements of an invisible, microscopic world that’s all around us. 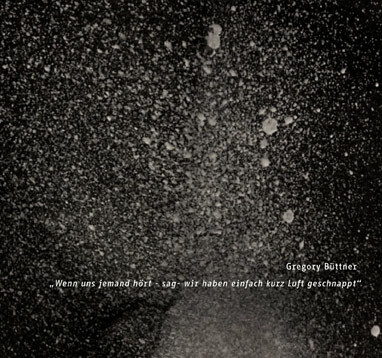 The first track of the latest release by Gregory Büttner for 1000füssler  Wenn uns jemand hört  sag  wir haben einfach kurz Luft geschnappt  re-proposes a special composition for the eponymous show by Anja Winterhalter, performer, photographer and dramatist who has for several years made Hamburg her base. Track 2 comes from another collaboration with Winterhalter and the audioplay/installation Echolot 1# Skipping Spaces. In this piece, audio sequences constructed by a machine vibrating sine waves, white noise and digital crackles were directed at specially prepared objects (e.g. cans, tubes and wooden boxes) in order to create and mix ‘metallic’ and sibilant feedbacks together. The effect is soft, acoustic and organic-sounding reverberations. The samples were then re-recorded to produce a mixture of fairly detailed and immersive sequences, dense in their infinitely small variations. Scalic jumps overlap and intertwine semi-chaotically, while always respecting a subtle harmony steeped in the electroacoustic tradition of which Gregory Büttner is a connoisseur. It should be noted that the original project of the first piece came about in 2010 and in 2011 Büttner also presented a live show with the same title at the Stark Bewölkt, a space dedicated to experimental music in Hamburg, in an ‘audio only’ production. The artist is  in short  back on the scene with this powerful and consistent release. The moods are sometimes extreme but they delicately stimulate our attention to detail with a slow expansion of treatments and atmospheres. This is a very interesting work that reconciles us with more experimental and abstract sounds. italian version: L’ultima uscita di Gregory Büttner per 1000füssler  forte del chilometrico titolo Wenn uns jemand hört  sag  wir haben einfach kurz Luft geschnappt  ripropone nella track 1 una speciale composizione per l’omonimo spettacolo di Anja Winterhalter, performer, fotografa e drammaturga contemporanea che ha ad Amburgo la sua base operativa già da diversi anni. Anche la track 2, “Falte”, deriva da una collaborazione con Anja Winterhalter, l’installazione audioplay Echolot 1# Skipping Spaces del 2011 e le sequenze audio costruite dal manipolatore sonoro sulle vibrazioni di onde sinusoidali, crepitii digitali e rumore bianco sono state indirizzate su oggetti appositamente preparati, ad esempio su lattine, tubi e scatole di legno, allo scopo di mescolare feedback “metallici” e sibilanti assieme a un po’ d’acustica dai riverberi più morbidi e organici. I suoni sono stati quindi ri-registrati in una miscela di sequenze assai dettagliate e immersive, dense d’infinitamente piccole variazioni, salti di scala, in una miscela di modulazioni dalle grane differenti, che si sovrappongono e s’intrecciano, tuttavia non caoticamente, sempre rispettando come una sottile armonia, comunque pregna della tradizione elettroacustica, della quale Gregory Büttner è un fine conoscitore. Va sottolineato che il progetto originario della prima piece fosse del 2010 e che nel 2011 pure Gregory Büttner aveva presentato una serata live dallo stesso titolo allo Stark Bewölkt, spazio dedicato alla experimental music ad Amburgo, in una versione “solo audio” della musica per lo spettacolo. L’artista ­ insomma  ritorna sul luogo del delitto e lo si può capire quando le suggestioni che ci rimanda ai nostri sensi sono così potenti e coerenti. Un suono estremo ma delicato che stimola la nostra attenzione ai dettagli con una lenta espansione dei trattamenti e delle atmosfere: una interessantissima uscita che ci riconcilia con le sonorità più sperimentali e astratte. Sur ce nouveau disque qu’il publie sur 1000füssler, son label, Gregoy Büttner réinterprète  revoit, même  deux de ses compositions plus tôt créées par Anja Winterhalter. La plus courte des deux pièces est celle qui donne son nom au disque, Wenn Uns Jemand Hört - Sag - Wir Haben Einfach Kurz Luft Geschnappt. Là, Büttner confectionne un ouvrage électronique qui perce et crépite, se tait plusieurs fois, repart sous l’impulsion d’un grave pour faire état ensuite état de microcouches sonores dont la disparité n’interdit pas l’accord. Sur Falte, il arrange sur plus de trente minutes des séquences électroacoustiques faites d’ondes sinus, d’éclats d’objets et de chants enfouis. Plus « saisissable » que celle qui l’a précédée, la pièce enfile des bruits divers et métamorphosés par un intérêt pour le son juste, quand ce n’est pas rare. L’art avec lequel Büttner se penche au chevet d’un infiniment petit qu’il a imaginé puis créé de toutes pièces et à qui, enfin, il insuffle vie étant le point commun à ces deux créations intrigantes. Ein Negativabzug der geschnappten Luftlöcher? Mehr Reduktion auf akustische Nadelstiche geht kaum. Bis in der 6. Min. eine Maschine sich einschaltet, deren Sirren jedoch abrupt von völliger Geräuschlosigkeit abgeschnitten wird. Worauf wieder das körnige Ploppen und Pixeln einsetzt, gefolgt von einer pochenden Linie und einer wässrig sirrenden, mit dem Funkeln platzender Bläschen. Dann wieder Stille. Und so weiter. Eine extreme Laut- und Kurzschrift am Nullmeridian der Klangsphäre. Entwickelt hat Büttner diesen speziellen Nachtgesang im Zusammenspiel mit einer Performance von Anja Winterhalter. Wenn jemand was hört und sich gestört fühlt, einfach stumm und mit Bedauern den Kopf schütteln und auf das Glas Mineralwasser in der Hand und den surrenden Kühlschrank deuten. 'Falte' geht zurück auf Echolot 1 Kippende Räume“, eine weitere Kollaboration mit Winterhalter, mit dem Versprechen: "...Aufgespannt zwischen Hülle und Falte. Sie bilden den noch trägen Innenraum der Ausdehnung. Eine luftgetränkte Bewegung. Ein rhythmisch umschlagender Sog der ausläuft, und für einen kurzen Moment schwebt.“ Büttner nennt dazu nun als seine Mittel: Sinuswellen, digitales Knistern, White Noise. Damit und mit Blechdosen, Plastikröhren und Holzkisten als Resonatoren entstand eine gut halbstündige Folge durchaus recht verschiedenartiger Klänge. Es sind feine Geräusche oder auch etwas gröber und voluminöser dröhnende, rauschende, rieselnde, manche abgeschnitten, manche ausschwingend. Der Sinuscharakter und manchmal auch eine aquatische Anmutung erinnern ein klein wenig an die Untersuchungen, die Meister Tietchens an und unter der Wasserkante durchgeführt hat. Manchmal klingt es wie eine angezupfte Stimmgabel und insgesamt wie metalloide, lineare Percussion mit Einbrüchen von weißem Rauschen oder murmeligem Brodeln. 'Luftgetränkte Bewegung', 'Innenraum', das passt zur Wahrnehmung. On his own label 1000Füssler, Büttner has a new release with two slightly older pieces and the first one is the title piece, which he translates as 'if somebody hears us - tell them - we only had to catch a breath', and its music to a performance piece by Anja Winterhalter and it's from 2010. What the performance was about isn't mentioned, which is perhaps a pity as now it remains a piece of music, created with the use of cracks, hiss, pops. Büttner uses a laptop, but also field recordings, microphones, small speakers, objects and some treatment of all of that, again using the laptop. That's the kind of work we find here in this title piece and Büttner does a fine job, but not something out of the ordinary I think. It fits his own previous releases, perhaps a bit more refined, a bit more delicate, but at nineteen minutes also perhaps a bit on the long side for what it is. 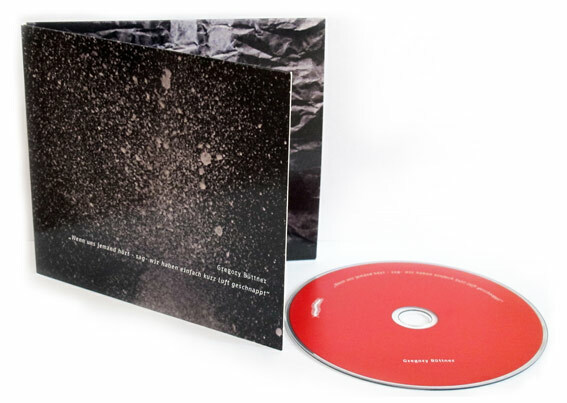 The other piece on this release is 'Falte', which is over thirty-three minutes, which uses sine waves, digital crackles and white noise, which Büttner plays back over different external loudspeakers, which were prepared with resonant objects like tin cans, tubes, wooden boxes 'to add some natural acoustics' and also "pure sine wave without any overtones reacted with the physical characteristics of a tin can or white noise be filtered by the resonance chamber of a plastic tube'. A work that belongs to the world of musique concrete, I'd say. It's not easy, if not impossible at all, to tell why I enjoyed this piece over the other one. Maybe it's because it uses sounds that I find more appealing? Maybe the whole form sound collage works better in this piece? The sine waves shift back and forth and keep changing the way the sound, sometimes close by, sometimes from afar and clearly cut into lots of smaller segments: just like a mighty musique concrete piece would dictate a composer. There is nothing in here that is on an endless sustained routine or noise for the sake of more noise. Sometimes it's loud for sure, but then sometimes, in fact most of the times, it's not, and it moves along between various degrees of audibility, thus remaining to keep the attention of the listener until the very end. This is, for me at least, Büttner at his very best. This piece, alone, on a CD, would have been also just enough, and the title piece could have been a 3"CDR for the die-hard fans only.